Ricky Hatton plans to ruin old charge Ryan Burnett’s big night with the perfect game plan for Zhanat Zhakiyanov to unify the Bantamweight division when they clash for the IBF and WBA Super titles at the SSE Arena in Belfast on Saturday night, live on Sky Sports. Hatton brings Zhakiyanov to Belfast in an historic unification battle that sees the Manchester legend in the opposite corner to the man he introduced to the paid ranks. The IBF king turned pro with Hatton in 2012 but a stuttering start to his career saw him leave the ‘Hitman’ in 2014 after just four pro fights and team up with Adam Booth. Hatton has admitted that Belfast was right to move onto pastures new and was proud to see the 25 year old claim the IBF crown – but warns that he will have his hands full against the WBA Super king Zhakiyanov. “I knew 100 per cent that Ryan had the ability to go all the way when I was training him,” said Hatton. “I was having a lot of problems at the time, I wasn’t in a good place at all, and Ryan felt the training was better elsewhere. “I wasn’t the trainer I am today. I understand why he left. There are no hard feelings. The Ricky Hatton of today is in a miles better place than the Ricky Hatton back then. “I text him before his World Title fight with Haskins to say good luck and text him straight after to say congratulations. I think the world of Ryan and his family. He’s a great lad and a wonderful talent but I don’t think he’s going to beat us on the night. “Ryan’s done everything asked of him so far but he’s going to have to show more than his talent in this one. If he doesn’t nail Zhanat to the canvas in the first few rounds he’s in for a very tough night. But if he doesn’t put Zhanat over in the first few then goes on to win, I’ll be the first one to shake his hand. Zhakiyanov was the man in trouble early in his World title clash with Rau’shee Warren in February, hitting the canvas twice in the opening round in Ohio. 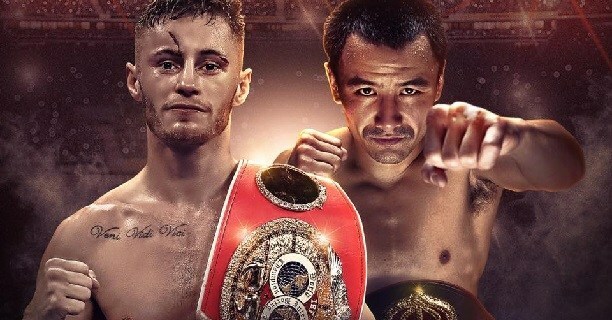 The hometown star was unable to put the visitor away though and Zhakiyanov recovered and pulled away from Warren to rip the WBA Super strap from him via split decision – a proud night for Hatton and one he feels will serve them well against Burnett. “He was never going to beat Warren on just boxing ability alone,” said Hatton. “He was going to beat him with a lot of heart and will to win the World Title. We had a good game plan overall but he made fundamental mistakes in the first round. I told him not to stand off Warren because he’ll ping you and what happened – he stood off and ended up on his arse. He can’t start the same against Ryan with all his skill. “He’s learnt lessons from it and come away with a World title. He went to Ohio in Warren’s backyard to take his belt and this time he goes into Ryan’s backyard so it’s nothing new to him and the experience will help. “He’s never looked better to be honest with you. I know you hear trainers say that a lot, but he has never looked this good. He couldn’t be any sharper. “He’s got an extra bit of ambition and determination for this one. There’s always been that bit of rivalry between the two. The fact he used to share a gym with Ryan and spar with him at the same weight.